First go to the ActivePython download page. 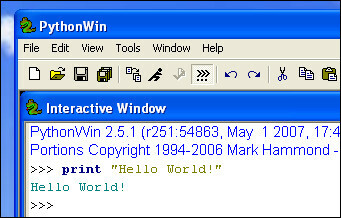 Launch the PythonWin Editor. This brings you to the command prompt of the Python interpreter. If you didn't know already, Perl is another extremely popular open source interpreted programming language. If you have ever tried writing a large program in Perl, you would have answered this question yourself!In other words, Perl programs are easy when they are small and it excels at small hacks and scripts to 'get work done'. However, they quickly become unwieldy once you start writing bigger programs and I am speaking this out of experience of writing large Perl programs at Yahoo! • Eric S. Raymond is the author of 'The Cathedral and the Bazaar' and is also the person who coined the term 'Open Source'. He says that Python has become his favorite programming language [http://www.linuxjournal.com/article.php?sid=3882]. This article was the real inspiration for my first brush with Python. • Bruce Eckel is the author of the famous 'Thinking in Java' and 'Thinking in C++' books. He says that no language has made him more productive than Python. He says that Python is perhaps the only language that focuses on making things easier for the programmer. Read the complete interview [http://www.artima.com/intv/aboutme.html] for more details. • Peter Norvig is a well-known Lisp author and Director of Search Quality at Google (thanks to Guido van Rossum). He says that Python has always been an integral part of Google. You can actually verify this statement by looking at the Google Jobs [http://www.google.com/jobs/index.html] page which lists Python knowledge as a requirement for software engineers. • Bruce Perens is a co-founder of OpenSource.org and the UserLinux project. UserLinux aims to create a standardized Linux distribution supported by multiple vendors. Python has beaten contenders like Perl and Ruby to become the main programming language that will be supported by UserLinux. If you're still reticient about making the plunge, you can get some convincing from Richard's Why Python on Windows XP? Richard mentions The Python Cookbook by Alex Martelli. You can buy the hard copy or chose from among the 2167 free recipes listed online. Here's the Beginner's Guide Overview on the Python.org wiki where you can get a quick view of the main features of this scripting language.